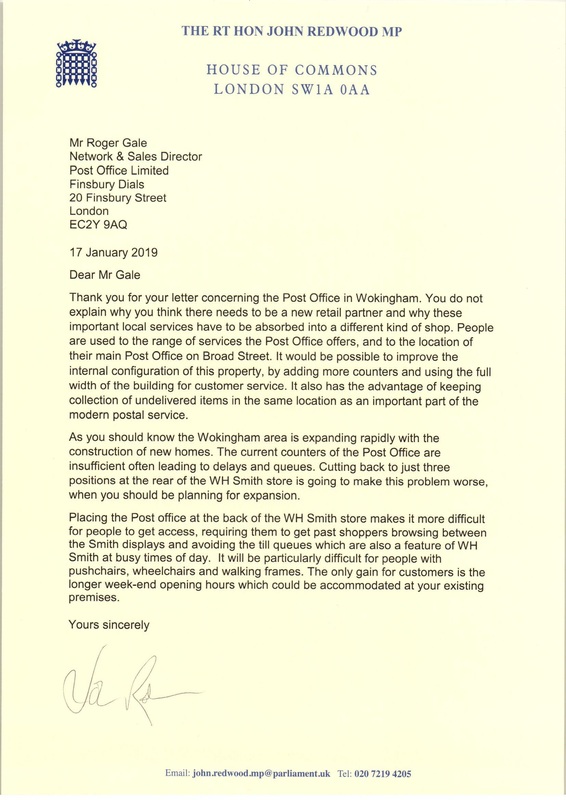 I have written to the Post Office regarding their proposal to move the Wokingham Post Office to commercial premises citing my reservations about the move. They are currently running a consultation and I would encourage residents to contribute to the consultation to make their views known. You can find the consultation at: https://www.postofficeviews.co.uk/national-consultation-team/wokingham-rg40-1aa-008939/. I, along with Wokingham Councillors, will be meeting with Mr Gale next month. Have filled in the consultation, but given it lacks even basic detail on the new location it can hardly be called a consultation exercise. My guess is they will move no matter what the responses they get, this is just a PR stunt to tick a few boxes. Amazing decision given purchases on line are growing at such a fast rate, as is the local population.